Windows 8, Windows 8.1, the Xbox One, Office 365, Windows Server, and more—if you thought that was a lot for Microsoft to deliver, hold onto your hats. Microsoft COO Kevin Turner promised Wednesday that Microsoft’s fiscal 2014 would be its biggest year of innovation ever. Turner, who took the stage at Microsoft’s Worldwide Partner Conference in full cheerleader mode, presented a summary slide of what the company hoped to accomplish in its next fiscal year, which begins this month. Those innovations include large meetings and Office integration for Skype; updates to both the Surface RT and Surface Pro, plus new accessories; and quarterly Office 365 updates, among others. 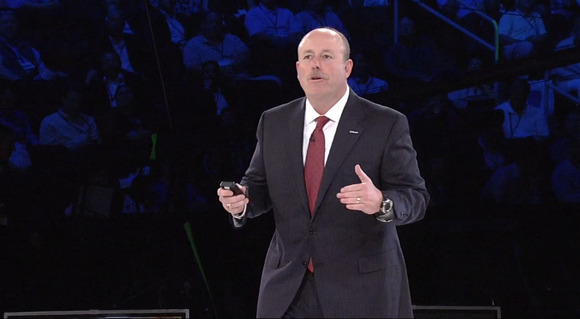 It was Turner’s job to close out the WPC, which ran the past three days and gathered Microsoft's top partners in Houston, Texas, to encourage them to keep promoting Microsoft’s devices and services. The WPC tends to focus on the enterprise, and Microsoft on Wednesday announced a new program called CityNext, where Microsoft will work with large cities to design packages of hardware, software, and cloud services to make the city’s own services and data more accessible to its citizens. ”The reality is that this is about accelerating growth together,” Turner said. 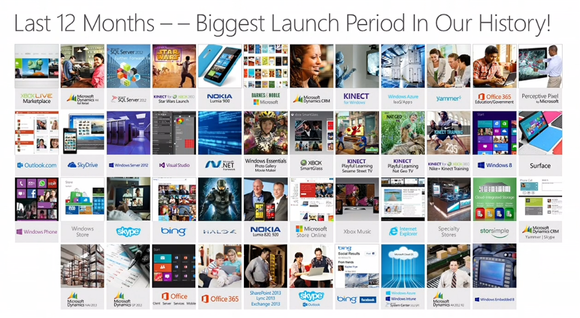 Microsoft’s accomplishments through July 2013. ’We get the best feedback bar none from our partner network, and I’m very very very appreciative of that,” Turner said. Windows 8.1, which the company recently released in preview mode and will hand to OEMs at the end of August, showed that “most importantly, we’re listening,” Turner said. Interestingly, Turner said that in the enterprise, 73 percent of enterprise customers are “current” on Windows, and 62 percent are current on Office, implying that there’s been a wholesale switch to the current version of Windows, Windows 8. That could go a long way toward explaining Microsoft’s early success in Windows, when it reported higher revenue and licensing than most expected. Still, he said, the Windows app space is months and months behind where its competitors are—even though Turner, like others, now claims that Windows Phone is the third of the top three smartphone platforms, behind Google’s Android and Apple’s iOS. Some of the slide's promises were vague—“killer hardware” for Windows Phone, for example—and some arguably had taken place, like ”music service updates” to the Xbox platform, which took place on July 1. Others, like integration of Skype into Outlook.com, have been rolled out in preview form. 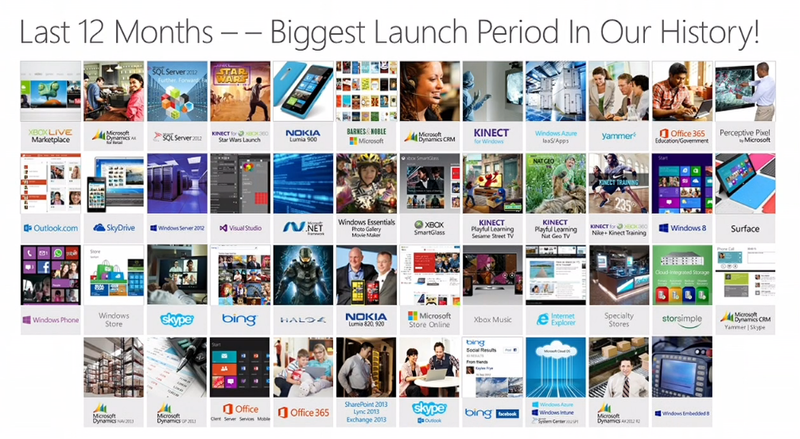 Microsoft’s WPC is like its company’s New Year’s celebration, ringing out the old and ushering in the new. On Thursday, Microsoft is expected to reshuffle its organizational structure to help do just that. If nothing else, Microsoft is promising things won’t be boring in Redmond over the next few months.